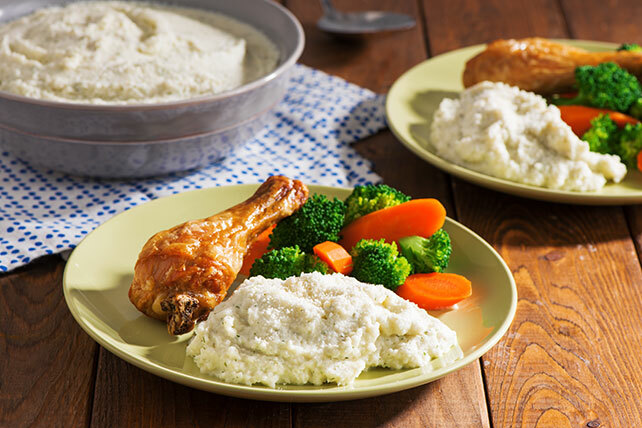 Try this Creamy Mashed Cauliflower recipe as an alternative to mashed potatoes. Made with cream cheese & dill, you'll love Creamy Mashed Cauliflower. Cook cauliflower in boiling water in saucepan 10 min. or until tender; drain. Place in food processor. Add reduced-fat cream cheese and dill; process until smooth. Prepare as directed except do not top with Parmesan; place in microwavable serving dish. Refrigerate up to 24 hours. When ready to serve, uncover and microwave on HIGH 4 to 5 min. or until heated through, stirring every 2 min. Sprinkle with Parmesan. Makes 4 servings, 2/3 cup each.